Well, this one was fighting me all the way trough the building process and it took almost two months to finish this project. Problems with driver, LED’s, focusing and almost anything that I laid my hands on. Never the less, when I look back, it was fun to customize this zoomie to my specs. Everything that was done is probably unnecessary and overkill but what can I do? 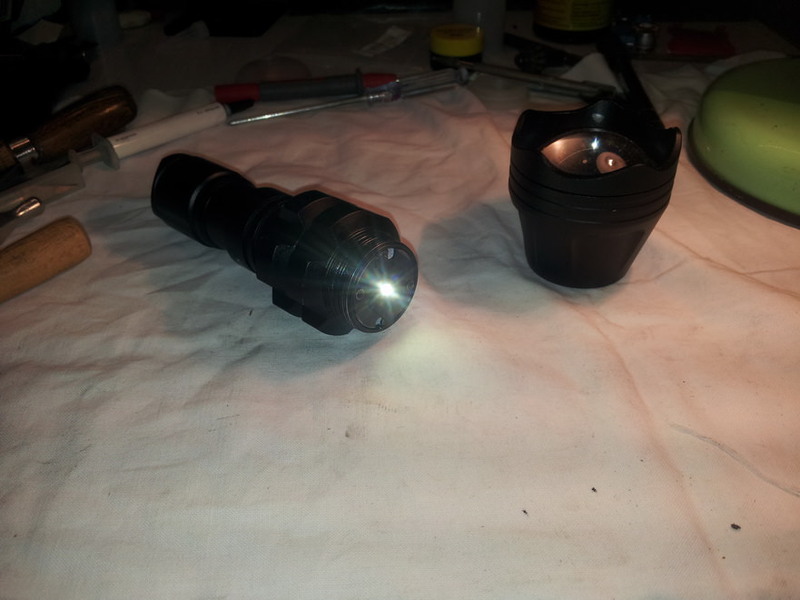 I like my flashlights highly customized and built to my imaginary standards. 2. 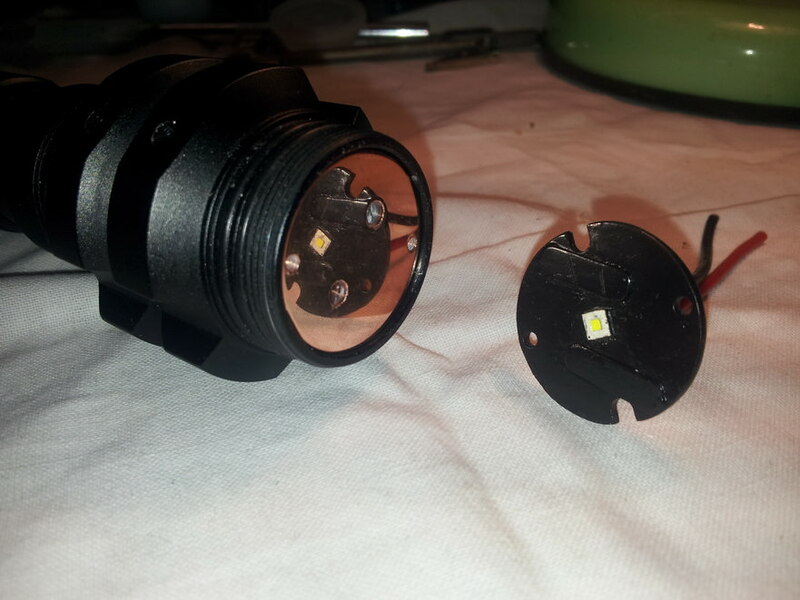 LED’s – well known problem with new XP-G2 S4 2B, I never managed to get the old one. I have thrown away exactly three new XP-G2 S4 ordered from IOS, and six or seven XP-G2 S2 ordered from FT and Kaidomain all due to ugly color when dedomed, high VF and low throw in general. Finally I managed to pick a few “good ones” from Kaidomain (Triples in series on aluminum star) that showed good results. 3. Focusing – It was very hard to focus properly due to the changed pill dimensions (height of the pill). It was mainly trial and error kind of thing. 3. I don’t like forward clickie switches. Plan is to swap it with omten reverse clickie. 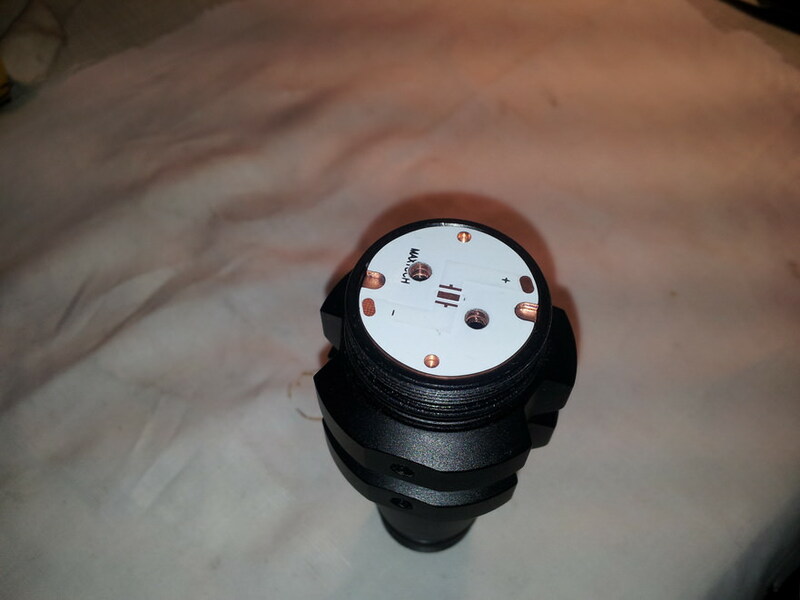 It is going to be mounted on a new contact board. 4. 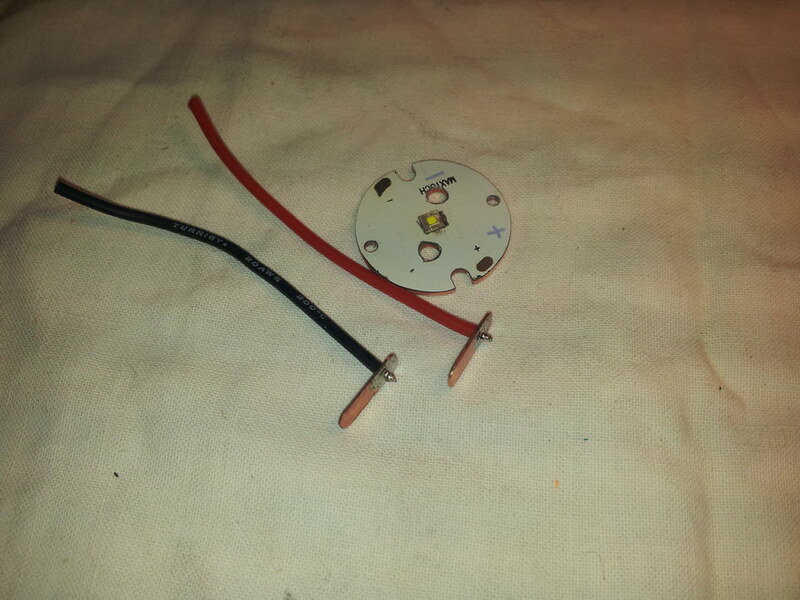 Made a groove in the contact board to accommodate 20 AWG wire. 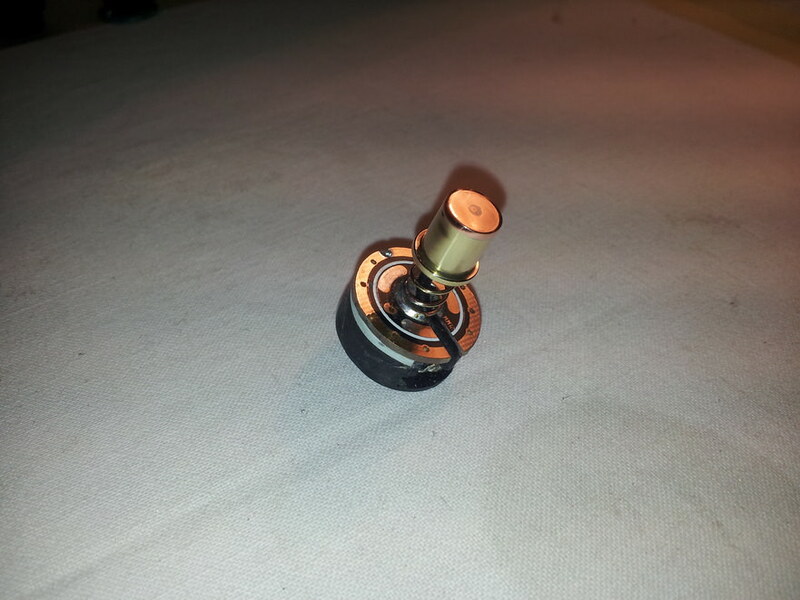 Due to the height differences, new omten switch is raised by few millimeters with epoxy putty. 5. 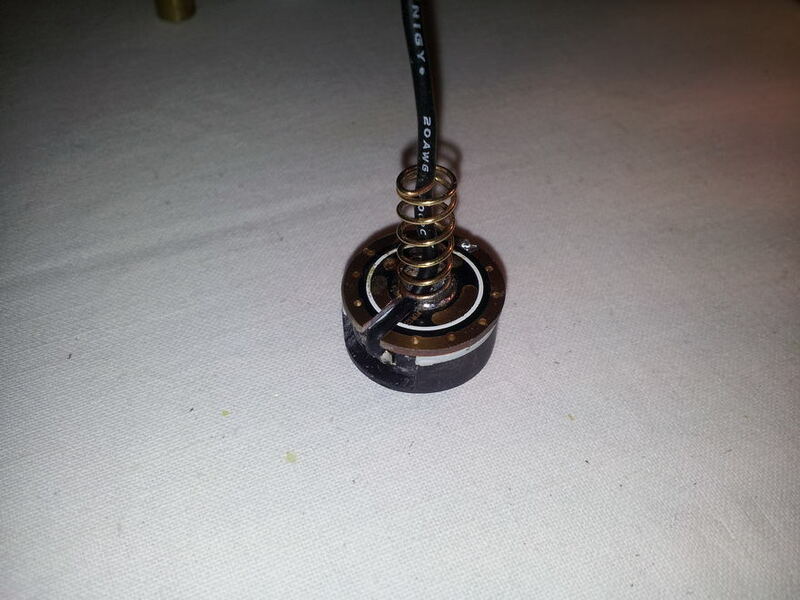 20 AWG wire threaded trough the grove and spring. 6. 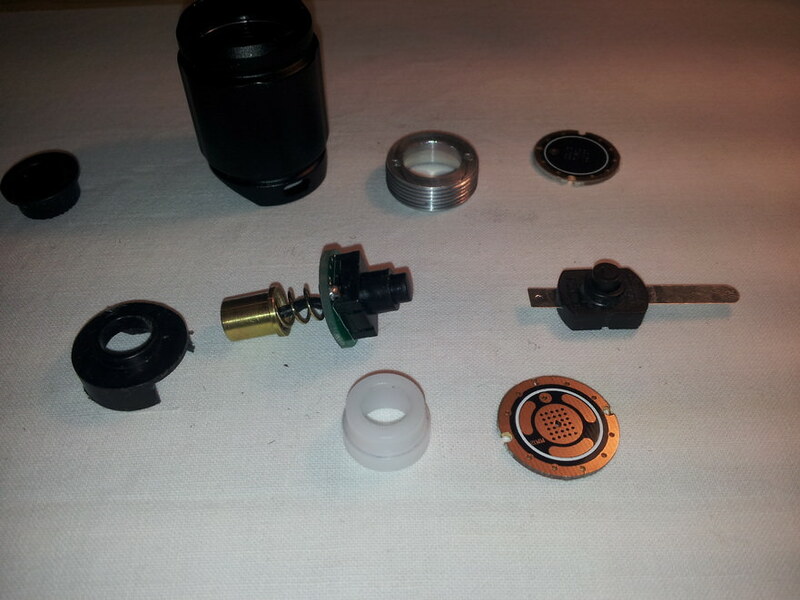 Preparing for spring and brass lid bypass. 7. Copper top added. Just a small amount of solder is needed to finish the bypass. 8. Switch mode done. Cleaned and polished. 9. Pill is cut. There is no turning back now. 10. 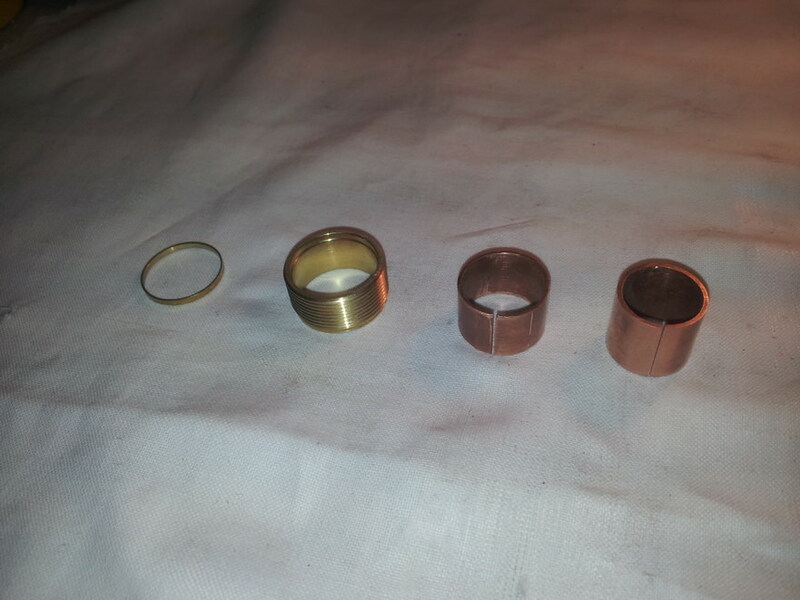 Copper cylinders cut and trimmed to fit inside the brass cylinder. 12. Soldered. Time to do some cleaning. 13. 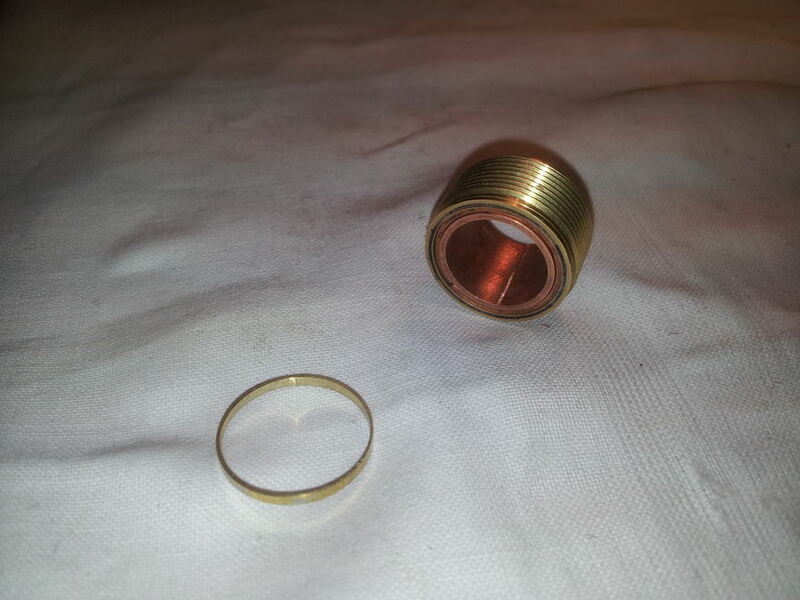 Copper brass ring cleaned and polished. 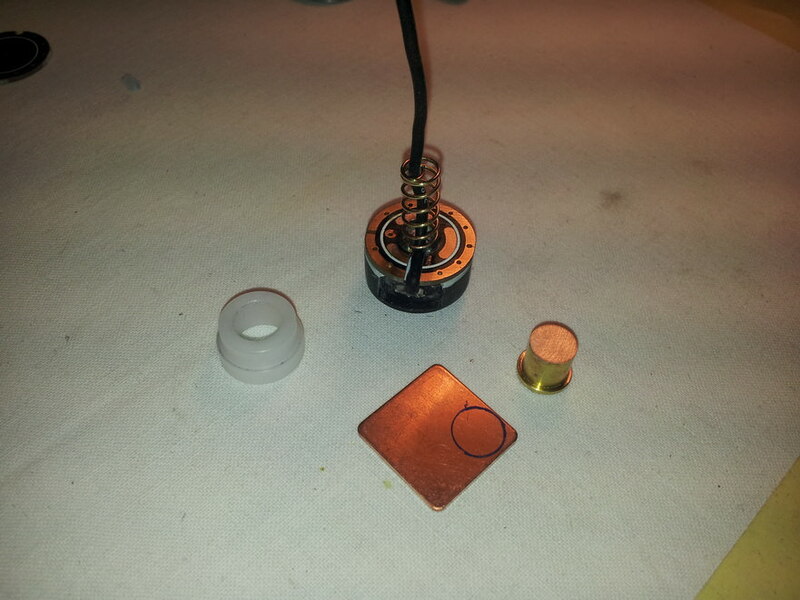 Preparing the base, three 1 millimeter copper circles soldered together. 14. 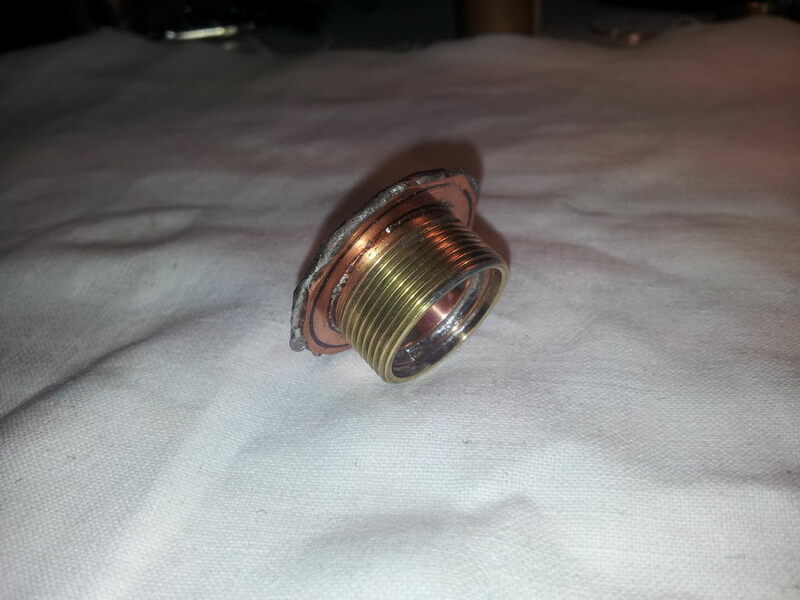 Ring and base joined. 16. Pill cut and trimmed to fit inside the body. 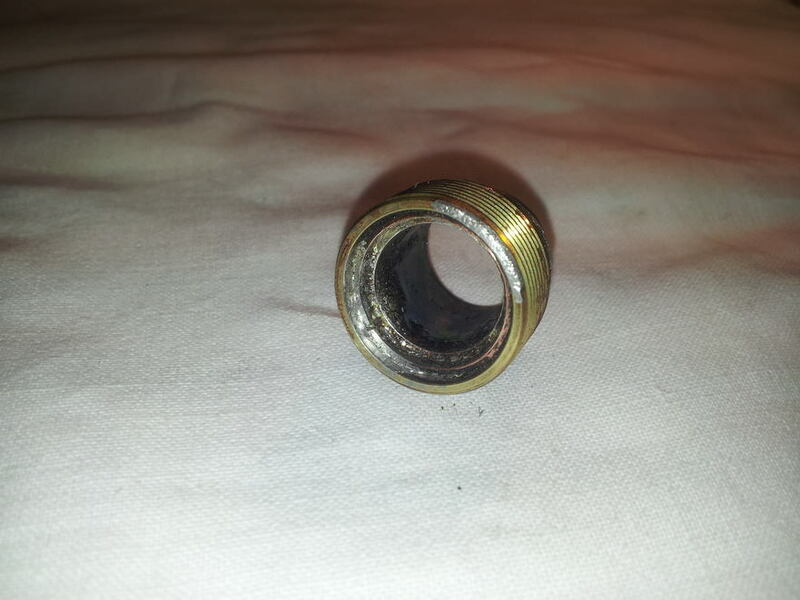 Maxtoch 32mm was almost the perfect fit. No problem there. 17. Perfect fit for both pill and MCPCB. 18. 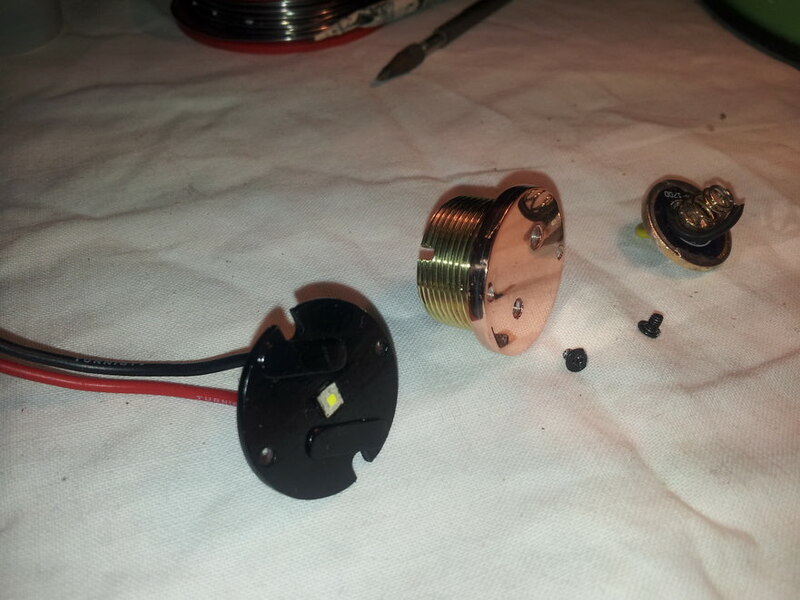 Repaired FET driver, finished hybrid pill and dedomed XP-G2 S2 1A led. 19. 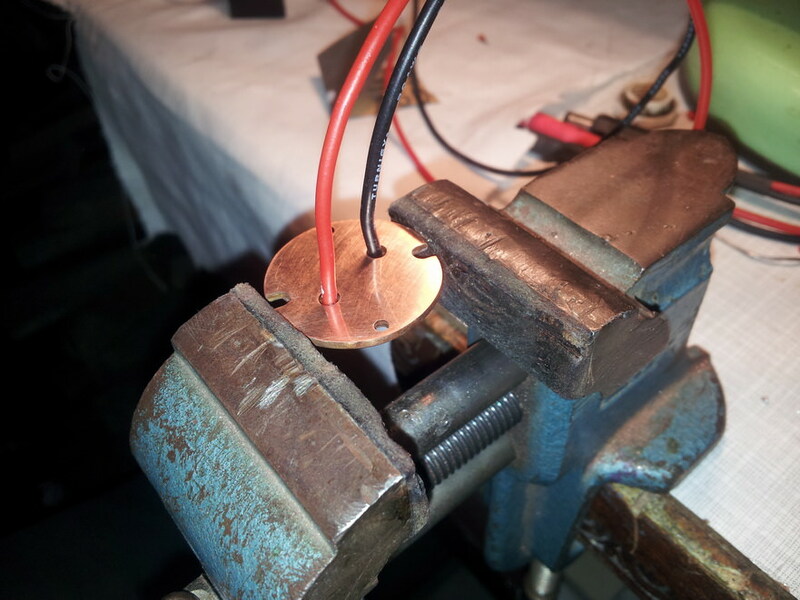 Preparing the 20 AWG wires. 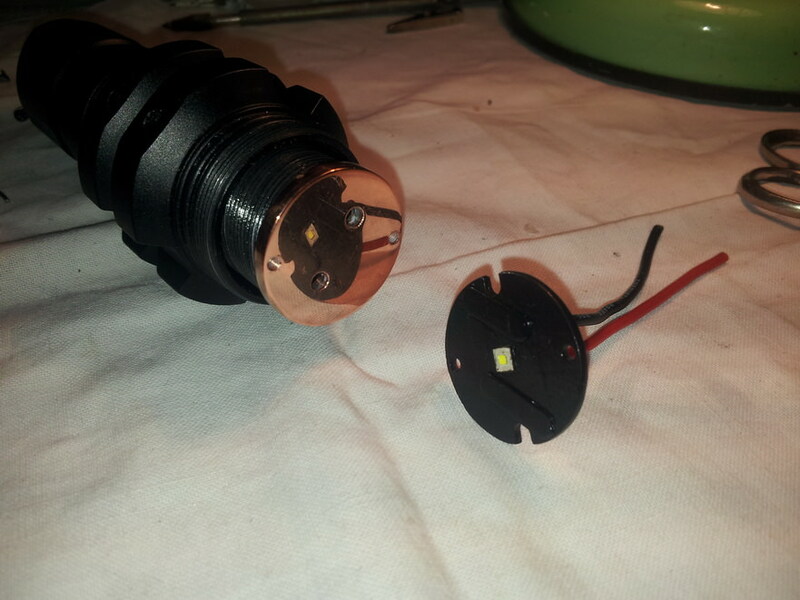 They are going to be connected to small copper plates and everything should stay below the led. 23. Assembly day. MCPCB is mat painted with heat resistant paint (for ovens). 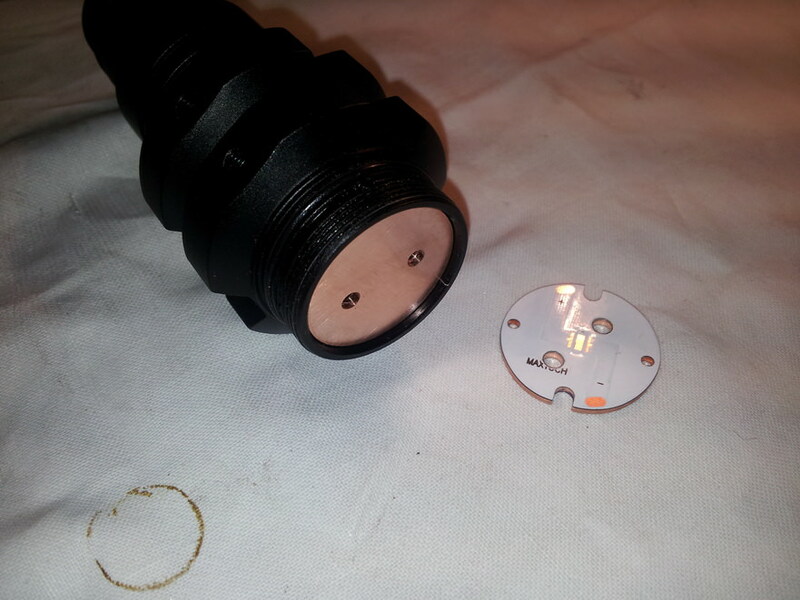 MCPCB is going to be tightened with 2mm screws. 24. 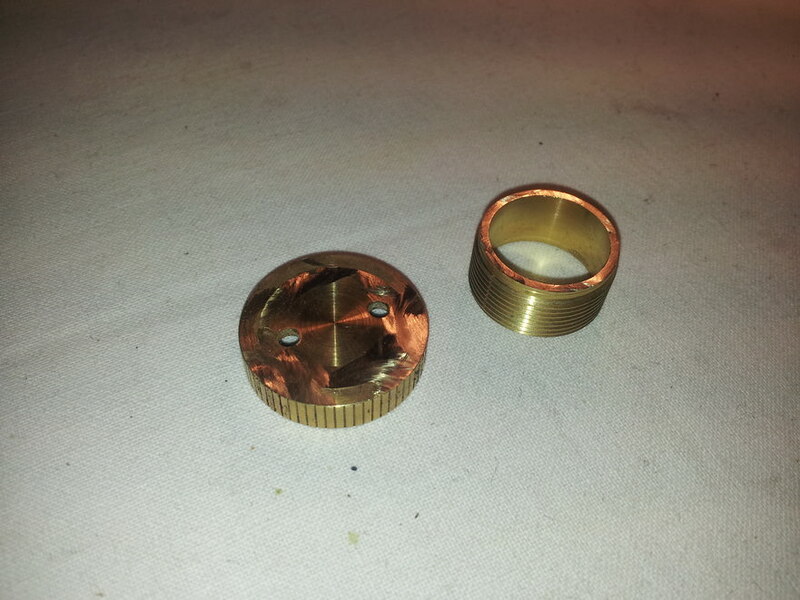 Polished copper pill in its place. 27. Arctic MX-4 thermal paste is added and MCPCB is bolted down. 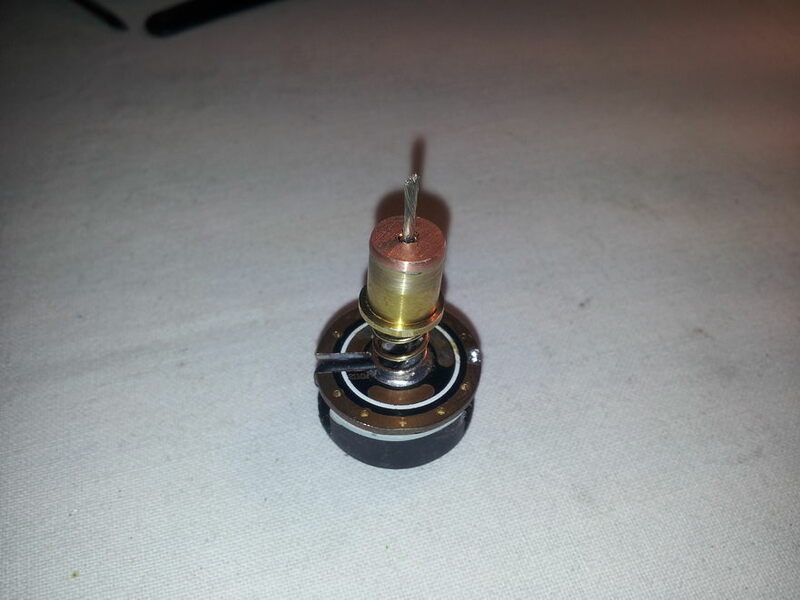 XP-G2 S2 1A dedomed is pushed at 4.95A on high so it is a probably from some older batch with low VF. 270 Kcd at 5.3 meters after 30 sec. Not to bad, I’m happy. If you like my mod please comment. I’ll gladly answer any question. Love the copper work. It makes me feels so satisfied. Excellent job all around! I especially like the switch work. Wonderful. I think I’m gonna hope that hoop makes some. I have other plans for the body of the light. What a very nice mod. Love the way you ran the power leads for the led. 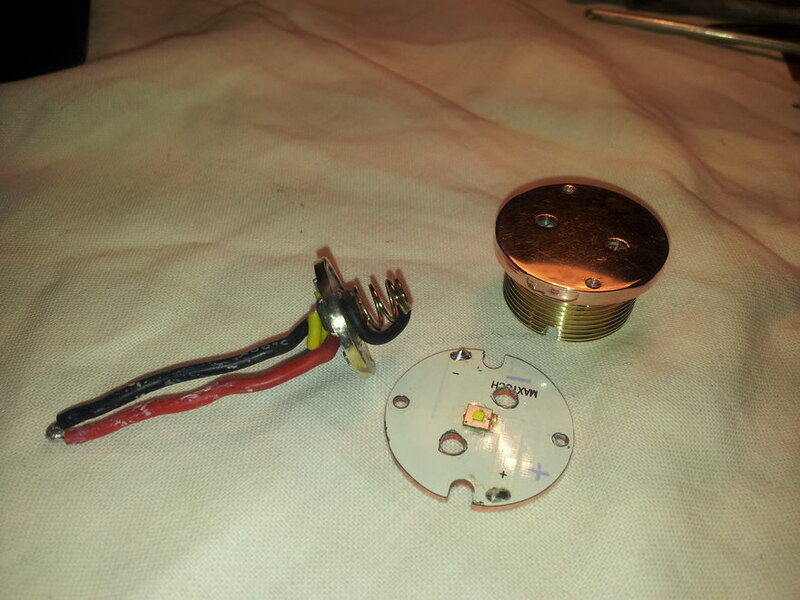 I’ve always wondered why they don’t make MCPCBs with recessed solder pads. 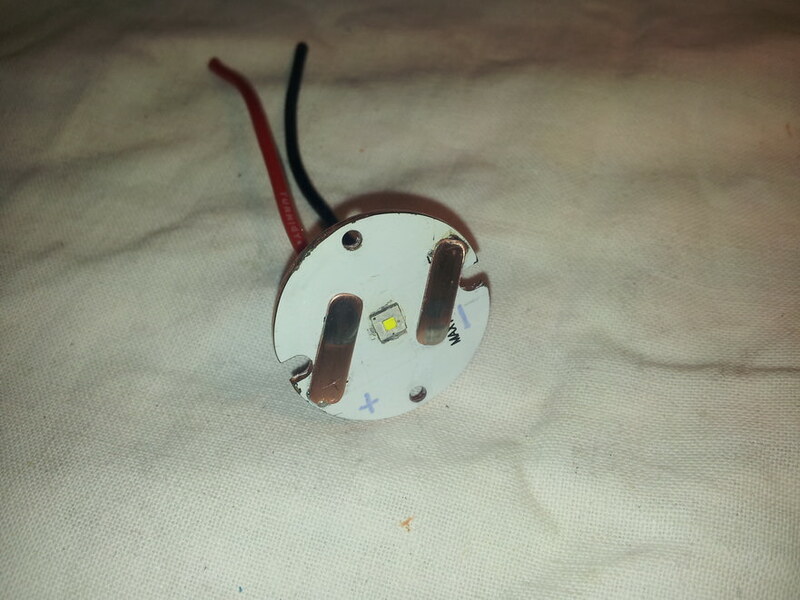 It would make led focusing in reflector lights much easier. I may try your method sometime. Attaching the wires like this didn’t improve the beam. It stayed pretty much the same. It was probably unnecessary but it surely looks neat. Black paint did some “cleaning” of the beam but only when white wall hunting. Artifacts are less visible. Wish I could get my hands on some old XP-G2 S4’s. Like this it always feels like unfinished job. 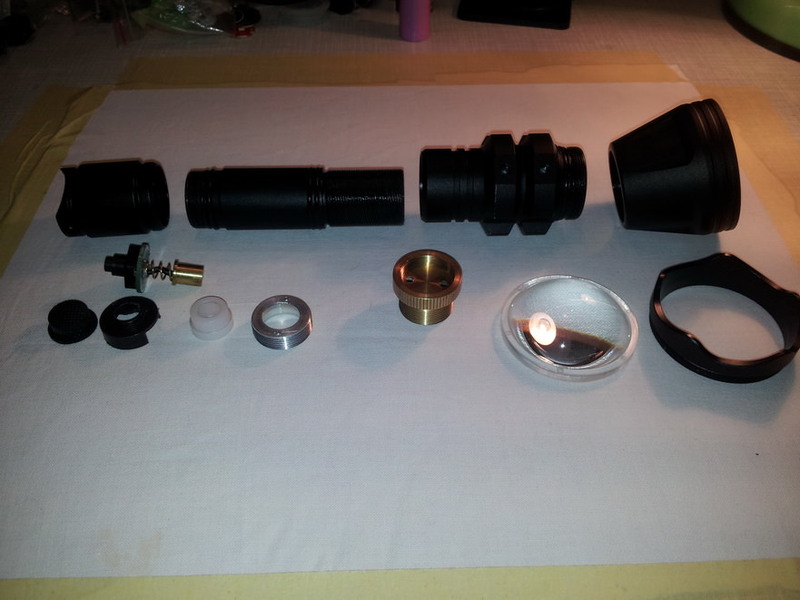 Did try to make some beamshots last night but I failed miserably. Another nice piece of work, Cula. This is awesome… The light really screams now. Very nice build. Dig your style and problem solving. 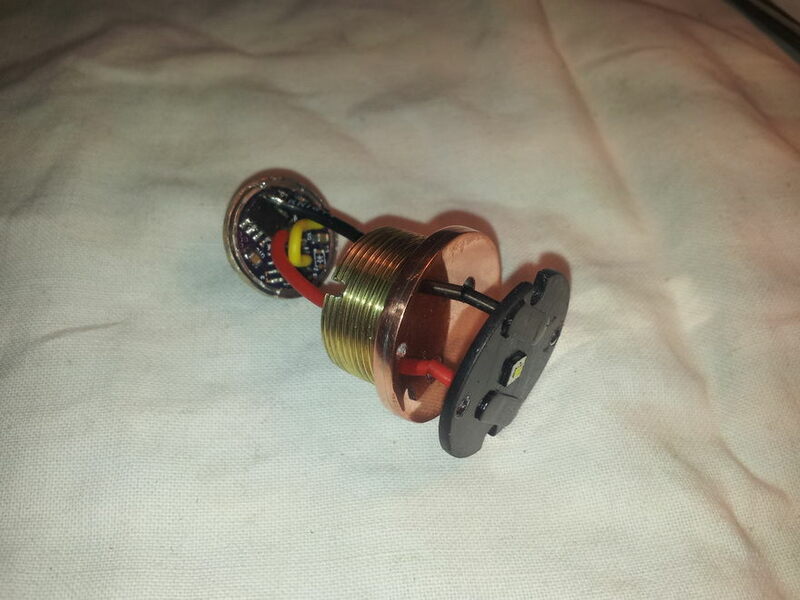 For builds where I plan on driving the emitter near it’s limits, I like to build pills similar to this one with higher melting temp silver bearing solder and then reflow the MCPCB to the pill with 60/40 or 63/37 solder. 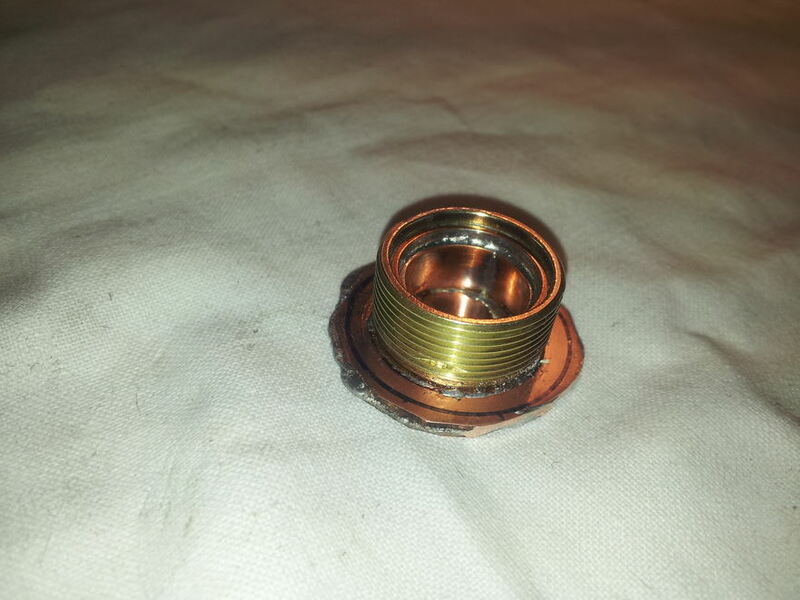 May I ask what was your source for the copper used for the top of the pill? You may not have an old XP-G2 S4 right now, but something even better will eventually come out and you will have this great light waiting for it. 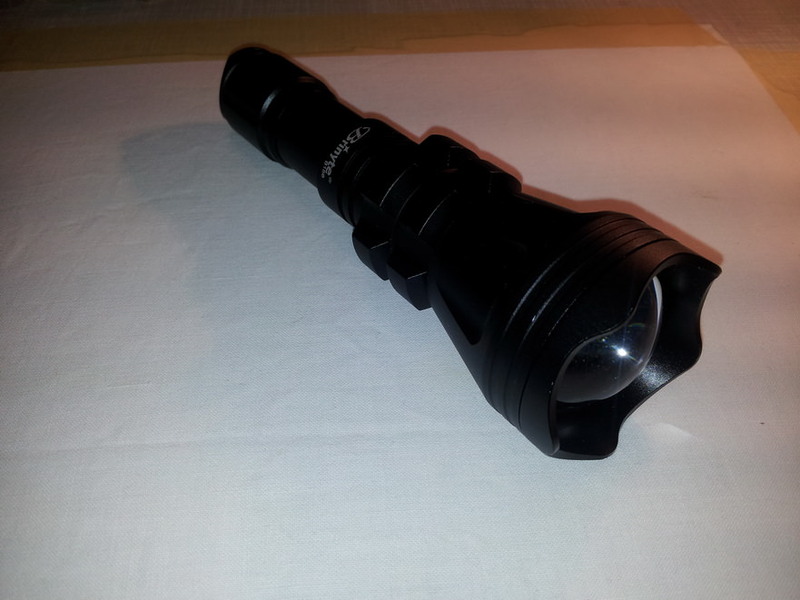 I fell in love in this flashlight after your review. 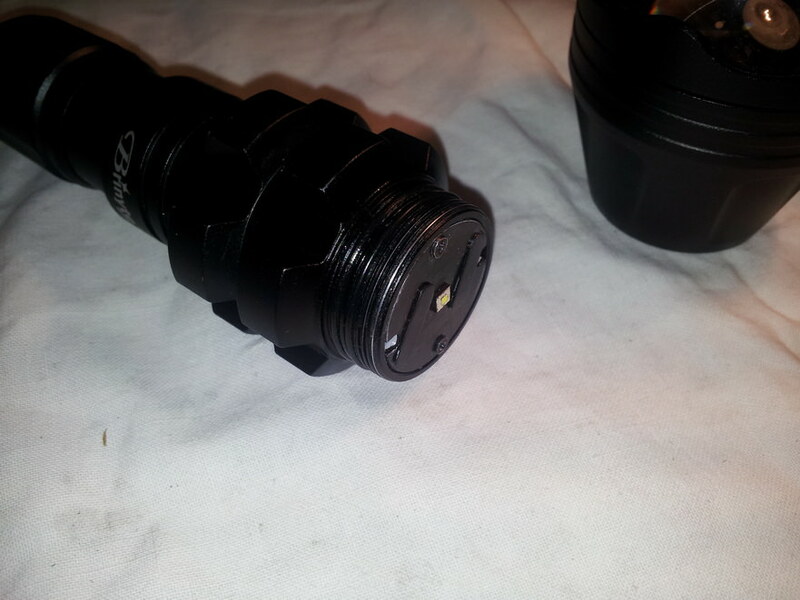 It is a proper budget light, very well built and on top of all, a performer. 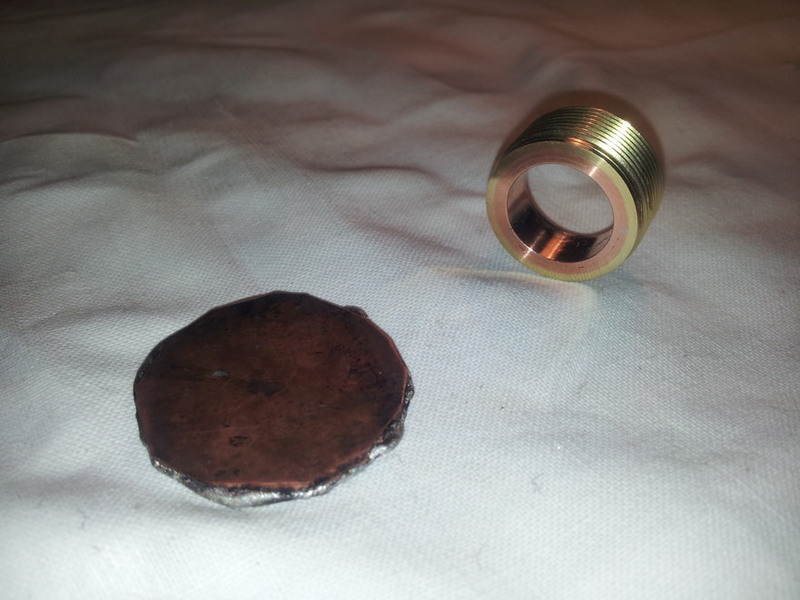 I got one big sheet of 1mm copper on the local scrapyard long time ago. I got lucky I guess. The seller didn’t know what it was, payed only few dollars for it. I bought it and it collected dust for a couple of years until I got myself into this hobby. Everything else on ebay (pipes, rods). It is very expensive so you have to choose carefully to buy exactly what you need. Very cool. I like your ingenuity (seems there’s no problem you can’t solve, with an highly upgraded effectiveness) with the copper/brass pill and the mcpcb, brilliantly righteous!! An extremely nice build, perhaps not everything was necessary, but who cares with such beatiful work! Very nice build. Dig your style and problem solving. 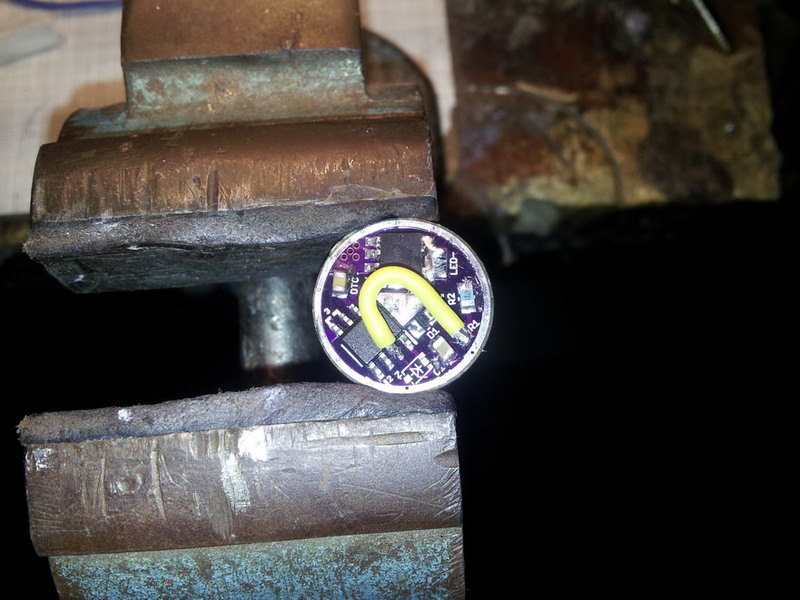 For builds where I plan on driving the emitter near it's limits, I like to build pills similar to this one with higher melting temp silver bearing solder and then reflow the MCPCB to the pill with 60/40 or 63/37 solder. 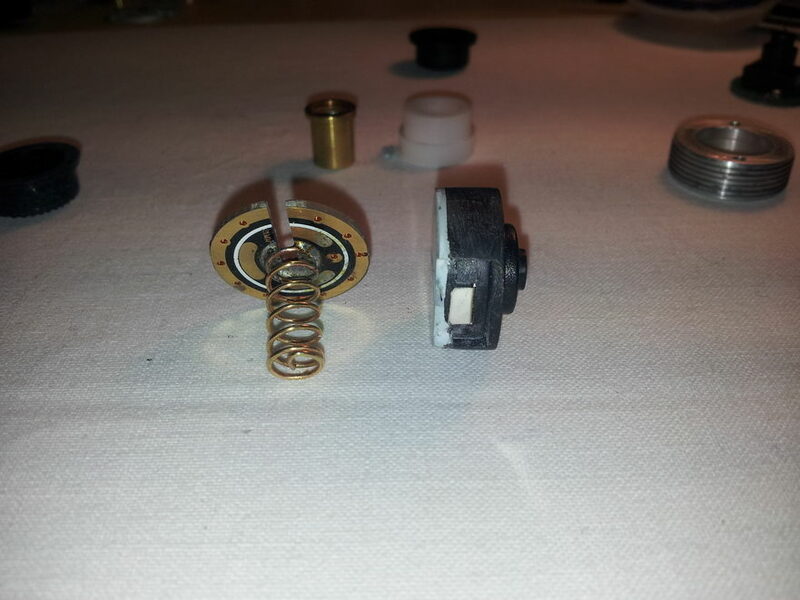 May I ask what was your source for the copper used for the top of the pill? You may not have an old XP-G2 S4 right now, but something even better will eventually come out and you will have this great light waiting for it. Was thinking your answer would be along those lines. Saw that aged look in the pic before you lapped the top of the pill. Really respect your resourcefulness. My hat is off to you. Very nice and beautiful(real beauty ) but complicated and labor demanding mod. 270kcd with old XP-G2 S2 1A is not something to be underestimated… Although you probably weren’t to lucky in pick. Will you apply for 4th Annual Old-Lumens Scratch Build contest? I want to pick you for my dodge ball team .